Talks between the students protesting in Hong Kong for universal suffrage and the Hong Kong government will start on Friday. It looks like the Chinese Communist Party might be serious about negotiating. The Chinese regime’s state-run media didn’t get the memo. According to People’s Daily, the CCP’s mouthpiece, the democracy movement Occupy Central is illegal, it will destroy Hong Kong, and foreign forces are behind it. Faced with this illegal, destructive, and imperial threat, Beijing has stated firmly in the newspaper’s pages that it will not compromise. In fact, one should have expected no less. Are these media that seem to be speaking for the Chinese regime part of that regime? Have they registered as foreign agents according to Foreign Agent Registration Act in the United States? During the campaign organized by the CCP against Occupy Central, the Hong Kong students have been blamed for being “aggressive.” Their aggression consists of having asked for what is called in Hong Kong “citizen nomination”—the ability of citizens to nominate who will run for the office of chief executive. This form of nomination is not described in Hong Kong’s constitution, the Basic Law. Before the CCP’s rubber-stamp legislature, the National People’s Congress, issued a decision on Aug. 31 allowing elections in Hong Kong but reserving to a committee controlled by Beijing the nomination of candidates for chief executive, the moderate democrats in Hong Kong sought to find a possible negotiation space with Beijing. The only problem was, nobody really knew what was a deal breaker for Beijing. In other words, the moderates’ suggestions and the students’ demands are very likely equally objectionable in Beijing’s view. There was no negotiation space from the beginning. Beijing is notorious for not keeping its promises to the people under its rule. During 65 years of communist rule, there has not been a single case of the CCP negotiating with or compromising with groups inside China. It did not compromise with the Dalai Lama in 1959 or at any time since. It did not compromise with the Tiananmen Square students in 1989, nor with Falun Gong practitioners in 1999. There is simply no such word as “compromise” in the CCP’s dictionary. In Tibet, the CCP broke an agreement with the Tibetan government by initiating a “bloody democracy reform” in 1955, according to Li Jianglin, who investigated and then wrote a book about what really happened before the Dalai Lama escaped to India. In the case of Tiananmen, the hardliners in the leadership never promised anything. In the case of Falun Gong, CCP head Jiang Zemin himself broke the agreement reached with Falun Gong practitioners on April 25,1999 by then-Premier Zhu Rongji. The Tiananmen Square students were massacred. The Tibetans and Falun Gong practitioners have suffered genocide. Before the Aug. 31 National People’s Congress decision, many people believed that there was still space for Hongkongers to negotiate with the CCP even though there was no evidence to support the assumption. Now that the decision has been published, retreating is almost impossible for the CCP. The CCP’s response to protests in 2011 in the village of Wukan in Guangdong Province, next door to Hong Kong, provide an example of how the Chinese regime “compromises.” The Party shifted the focus away from the original demand. The original demand of villagers was that land seized by government-backed developers be returned. However, the settlement was about letting the villagers elect their own village officials, not about returning their land. In negotiations with the protesters in Hong Kong, the Party will want to shift the original demand from true universal suffrage. Although it’s not likely to happen now, chief executive Leung Chun-ying may become a scapegoat. His dismissal would certainly please most Hongkongers. The people of Hong Kong had gotten the impression that democracy would come with reunification with the mainland. According to Chris Patten, the last British governor of Hong Kong, Chinese leaders promised democracy. However, whatever was said to Patten, the impression has proven to be wrong. The key point is the Election Committee. This is how the CCP manipulates the elections for Hong Kong’s Chief Executive. Actually, it’s just a modified version of the “elections” in mainland China. Elections are held in China for local representatives, but the CCP designed the nomination threshold to prevent independent candidates from being elected. Even when candidates do satisfy the nomination requirement, the CCP blocks them. In 2011, Liu Ping and Wei Zhonghua of Jiangxi Province were disqualified as independent candidates for the election for the local representatives even though they had met the official requirement of being nominated by more than 10 people. They were repeatedly harassed, placed under house arrest, and detained to prevent them from meeting the voters. Finally, both Liu and Wei were put behind bars by the local court this year. In August 2000, then-president Jiang Zemin even told 60 Minutes host Mike Wallace that he was also an elected leader. Well, in China, actually nobody knows how Jiang was elected—most people have not seen a real ballot their entire lives. In order to defend the denial of democracy to Hong Kong, the Chinese regime has sought to throw sand in the Chinese people’s eyes in various ways. Tracking down when and where exactly this argument started is difficult, but the concept has been used repeatedly by China’s state-owned media and circulated on social media. In any case, this claim is just false. First of all, the British did try to give Hong Kong some kind of democracy. According to William Wang, who is the expert on Hong Kong history, Britain wanted to make Hong Kong a self-governing Dominion, like Singapore, but was strongly opposed by the Chinese authorities. Then-Premier Zhou Enlai told visiting Lieutenant Colonel Cantlie that “China would regard any move towards Dominion status as a very unfriendly act. China wished the present colonial status of Hong Kong to continue with no change whatever.” That was in January 1958. Besides, democracy is not the opposite of colonialism. Independence is the opposite of colonialism, while democracy is the opposite of dictatorship. The reasonable argument is that during British rule, the Hong Kong people should demand independence, which they did. In Hong Kong’s special situation, independence had to be replaced by reunification with China. Once reunified with China, the Hong Kong people should demand democracy, which they are doing right now. Even the CCP didn’t ask Japanese for democracy during WWII. It did ask the Republic of China for democracy during the Civil War following Japan’s defeat, although the demand for democracy proved to be only an excuse to seize power. When the concept of Occupy Central was suggested in 2011, not many people noticed. Even the person who initiated it didn’t believe it could really happen. 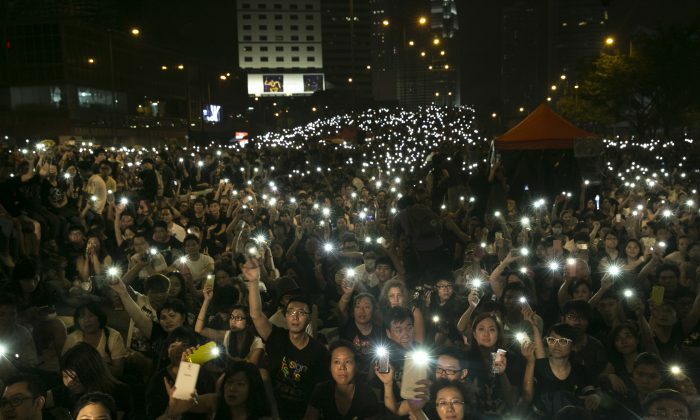 However, since then, at almost every turning point the Chinese regime has made things worse and made the mass demonstrations in Hong Kong possible. Step by step, the CCP pushed the Hong Kong people away. As usual, the Chinese regime and the state-run media blame foreign powers, especially the United States, as being behind Occupy Central. This charge has been made over and over again to incite hatred against the United States and strengthen the regime’s position as the defender of China. This time, though, the regime seeks to distract from its own responsibility for the events in Hong Kong. From the beginning, Beijing has made one bad judgment after another on Hong Kong issues. But this is not a run of bad luck, the causes for it are dyed into the very fabric of the Party. Even if the regime could do everything over again, it would make the same mistakes. It just can’t help itself. The difficulty Hong Kong poses for Xi Jinping, the thugs operating under official protection in that city, and the power of the U.S. example are discussed. Hong Kong student groups are calling on Chinese leader Xi Jinping to remove Hong Kong's chief executive and resolve the crisis.